from "Carolina Cobras Preseason Media Guide"
An indoor padded surface 85 feet wide and 50 yards long with eight-yard endzones. Goal posts are nine-feet wide with a crossbar height of 15 feet (NFL goal posts are 18 1/2 wide with the crossbar at 10 feet). The goalside rebound nets are 30 feet wide by 32 feet high. The bottom of the nets are eight feet above the ground. Sideline barriers are 48 inches high amd made of high density foam rubber. The official football is the same size and weight as the National Football League ball. Each ball is manufactured by Wilson Sporting Goods. Players play offense and defense with the exception of the kicker, quarterback, offensive specialist (the kick returner on defense) and two defensive specialists. Substitution: All non-specialists may substitute only once during each quarter. Three (3) defensive players must be down linemen (in a three of four-point stance). One linebacker may blitz on either side of the center. Alignment is two (2) or more yards off the line of scrimmage. No stunting or twisting. Off ensive motion: Once receiver may go in forward motion before the snap. Four 15 minute quarters with a 15-minute halftime. The clock stops for out-of-bounds plays or incomplete passes only in the last minute of each half or when the referee deems it necessary for penalties, injuries or timeouts. Each team is allowed three (3) time-outs per half. Four (4) downs are allowed to advance the ball ten (10) yards for a first down, or to score. Six (6) points for a touchdown. Three (3) points for a field goal by placement or four (4) points for a field goal by drop kick. Two (2) points for a safety. Punting is illegal. On fourth down, a team may go for a first down, touchdown or field goal. The receiving team may field any kickoff or missed field goal that rebounds off the net. Any kickoff untouched which its out of bounds will be placed at the 20-yard line or the place where it went out of bounds, whichever is more advantageous to the receiving team. Passing rules in Arena Football are the same as outdoor NCAA Football in which receivers must have one foot inbounds. A unique exception involves the rebound nets. A forward pass that rebounds off of the endzone net is a live ball and is in play until it touches the Paying surface. Each team gets one possession to score. It, after each team has had one possession and one team is ahead, that team wins. It the teams are tied after each has had a possession, the next team to score wins. There is no fair catch in Arena Football. One-inch tee may be used on field goal and extra point attempts. Forward passes that hit the sideline barrier goal line to goal line are alive and can be caught if receiver's feet are in bounds. (Only one foot needed). Any fumble of backward pass hitting the boards and rebounding into the field of play remains alive. When a runner touches the sideline barrier and pushes off, he is free to run as long as his feet are in bounds and he wasn't contacted by a defensive man. A runner who goes down on his own is eligible to get up and advance. To be legally down, he must have been touched/contacted by a defensive player. The field is 50 yards long by 28 yards wide. The two end zones are 8 yarads deep from goal line to endline. Uprights of the goal posts are 9 feet apart. The bottom of each upright is 8 feet above the playing surface, and the height of the crossbar is 15 feet above the playing surface. One coach may be on the field, goal line to goal line. He must be behind the sideline and at least 5 yards off the line of scrimmage. The clock does not stop on any out of bounds or incomplete passes, unless in the final minute of each half. Clock continues to run after TD's and during extra points, unless in last minute of each half. It a penalty occurs during the extra point before the last minute of each half, the clock is stopped and will not run if another attempt occurs. In the last minute of the game, if the offense is leading, they must gain positive yardage on rushes or passes completed behind the line of scrimmage - If positive yardage is not gained, the clock will stop, and restart at the next snap. Eight players on the field for each team. All players, with the exception of those termed specialists, shall only be allowed to substitute once during each quarter. Specialists are the quarterback, place kicker, wide receiver/kick returner, 2 defensive specialists, designated snapper, and kick holder. All free kicks originate from anywhere on the kicking team's goal line. The kicking team can never be closer than the receiver's 5 yard line, until the ball touches the turf or receiver after hitting the net. Once the ball hits the net and touches either the turf or the receiver, it is treated as a fumble and can be advanced by the kicking team. The receiving team must attempt to run the ball out of the end zone on both free kicks and scrimmage kicks. An eligible receiver remains eligible even if he intentionally steps out of bounds on all four boundary lines. A receiver can be in contact with the sideline barrier when making a catch goal line to goal line. 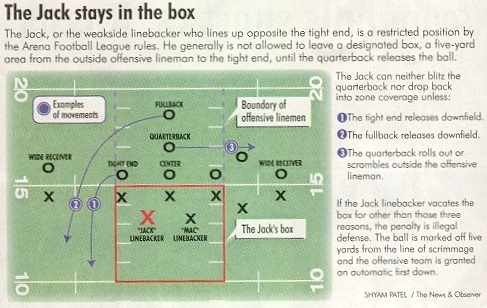 A forward pass that bounds off the sideline barrier is still in play until it hits the ground, goal line to goal line. After any illegal pass that is caught by the offensive team, play is dead. A receiver or defender can catch a pass even if his first contact is with the sideline barrier as long as his first contact is with the playing field inbound after the catch. Intentional pass interference in end zone, the ball is spotted at the one-yard line. In the last minute of play in each hall, only the person who fumbles the ball may recover and advance. even on a change of possession. A forward pass that hits the net on the fly remains in play. Two points for a successful drop kick for an extra point. Four points for a successful drop kick for a field goal. The defense cannot score on unsuccessful extra point attempts.